Researchers Find 115 Plastic Cups In Dead Whale's Stomach The following items were among those found in the animal's stomach: 19 pieces of hard plastic, two sandals, four plastic bottles, 25 plastic bags, and about seven pounds of rope. Researchers collect samples from the carcass of a dead whale at Wakatobi National Park in Southeast Sulawesi, Indonesia. 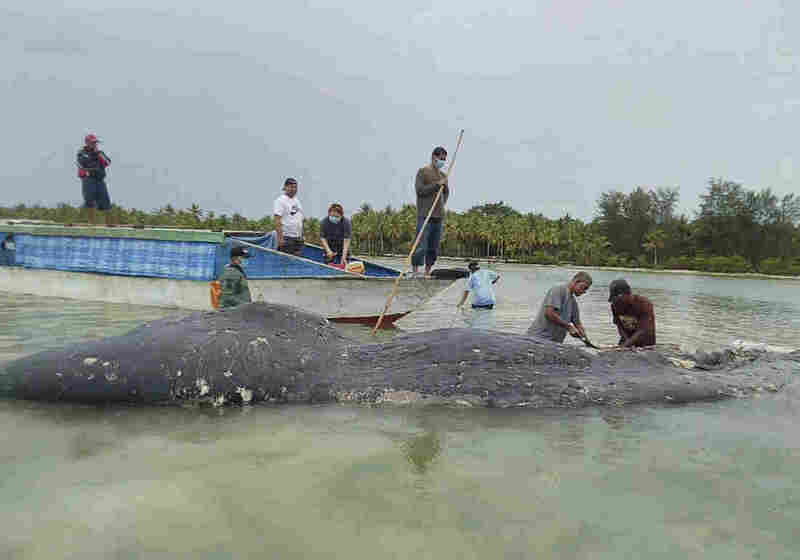 A dead sperm whale found in Indonesia had at least 13 pounds of garbage in its stomach, including 115 plastic cups and two sandals, according to a team of researchers including the World Wide Fund For Nature. "Although we have not been able to deduce the cause of death, the facts that we see are truly awful," Dwi Suprapti, a marine species conservation coordinator at WWF Indonesia, told The Associated Press. The dead animal was found earlier this week on Kapota Island, Southeast Sulawesi by a team from Wakatobi National Park, according to The Jakarta Post. The newspaper reported that the animal was starting to decompose when it was found. In addition to the cups and sandals, the WWF said the following items were found in the animal's stomach: 19 pieces of hard plastic, four plastic bottles, 25 plastic bags, and about seven pounds of rope. A photo of the materials found inside the whale posted by the WWF shows a teeming mound of garbage, including a tangle of what appears to be string and a broken piece of a plate. Wakatobi Marine and Fisheries Community Academy, which took part in the research, says the animal was about 9.5 m long (more than 31 feet). As NPR's Christopher Joyce has reported, Indonesia is the second-largest generator of plastic waste in the oceans, behind China. Joyce added that a 2015 analysis in the journal Science found that of an estimated 46 pounds of plastic waste produce per person in a year, up to 15 pounds of it ended up in the ocean. Luhut Binsar Pandjaitan, Indonesia's coordinating minister for maritime affairs, told the AP that he sees plastic waste as a "common enemy." The wire service writes that he said the government "is making efforts to reduce the use of plastic, including urging shops not to provide plastic bags for customers and teaching about the problem in schools nationwide to meet a government target of reducing plastic use by 70 percent by 2025." Last June, a pilot whale died in Thailand, and researchers found that its stomach contained more than 17 pounds of plastic, as National Geographic reported. At the time, Regina Asmutis-Silvia of the organization Whale and Dolphin Conservation told National Geographic that the plastic can confuse the animal's digestive system. "At some point their stomach fills up with trash and they can't eat real food," she said. "You're not getting any nutrients in and you've basically completely clogged your digestive system."